New developments in audio production don’t come along that often. People are fairly used to the idea of getting a new television every few years. You certainly don’t need to be an expert to spot the difference between 480p resolution and 4K. But when it comes to audio, people aren’t nearly as used to thinking in these terms. Part of the reason why is because sound technology hasn’t been growing nearly as fast, but changes do eventually make their way through. And without your notice, the next generation of earbuds you buy look totally unlike the first pair you put on. These incremental changes creep up on you, as you can see inside the AairHut A2. The AairHut A2 use a design that’s become wildly popular among athletes over the past few years. The earbuds themselves are exceptionally small and portable, but unlike strictly athletic earbuds, the A2 are far more versatile with the use of their included charging case. And built with Bluetooth 5.0, the AairHut A2 are made to make the most of modern standards. The A2 also have some fairly innovative features that help them stand out further. For example, the AairHut A2 allow you to use each ear-bud independently. Sometimes you’re listening to a podcast or audiobook, and you don’t actually need the immersion of two ears. Sometimes you want to be able to hear the environment around you rather than have everything drown out by music. In either case, using only one bud can nearly double your battery life. The AairHut A2 measure 0.8 x 0.4 x 0.4-inches, which is on the smaller side of average for in-ear Bluetooth earbuds. The matte exterior black casing is rather discreet. As with most modern athletic in-ear headphones, the A2 is designed to rest inside your ear bowl, with its audio tip pressed against the ear canal. Each bud weighs about one ounce, light enough that you wouldn’t notice their weight, if it wasn’t for the A2 pressing firmly against your ear. 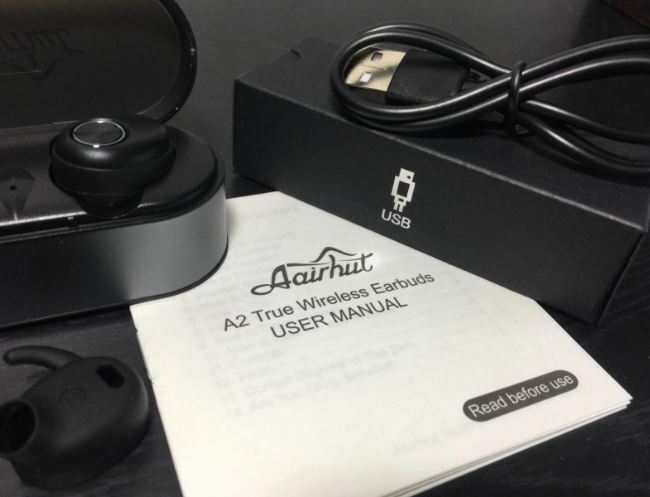 As its name suggests, the AairHut A2 Sweatproof Bluetooth True Wireless Earbuds use a sweat proof design, which means very light waterproofing. If you accidentally dropped one of your A2 earbuds and it splashed into a puddle, your earbud would probably survive. However, the thoroughness of sweat-proof water resistance isn’t something you want to push. Rain and sweat can be held off, but every moment of submersion is a risk. How easy or difficult it is to work with the AairHut A2 is largely the result of the casing. For instance, the AairHut A2 are easy to keep together thanks to the included casing. The casing provides storage for both earbuds, and holds its own independent charge to keep you going through the day. The casing itself is also fairly discreet. And volume control is accurate and smooth, especially when you’re using both earbuds. Even if you’re not worried about losing an earbud, it’s easier to keep your equipment cleaner when it’s stored away safely in a case. Another thing that’s easy to appreciate is the casing doesn’t have any setup involved, and there aren’t any steps to get started. You simply pull the A2 out of their case, place them in your ears, and you’re good to go. Dynamic headphone drivers are an extremely adaptable and relatively inexpensive technology. But it’s a technology with limits. Those limits also mean hard to create high quality sound from within tiny earbuds. Due to their position against the ear canal, there’s an especially small volume of air for buds to manipulate. Additionally, there’s the small problem of dynamic drivers needing to significant amounts of power to sound their best. Without getting into every technical details, there’s a fairly simple way to describe how the AairHut H2 exists within this hierarchy. In short, they’re built to sound about as great as you can make wireless dynamic-driver earbuds sound. With that said, every pair of high-end headphones has their own distinct sound profile. Some have amplified bass. Others have focused on clarity in high-tones or richness in mid-tones. There’s no right or wrong answer here, it comes down to a matter of taste. With respect to the AairHut A2, its soundscape is fairly balanced. AairHut elected against bloating their sound with boosted bass, which helps ensure the other tones don’t suffer by comparison. It’s fair to say that with respect to sound quality alone, the A2 is roughly comparable to any of the best dynamic drivers on the market, right up to the $300 range. As mentioned earlier, the AairHut A2 doesn’t enter the ear canal, but it does rest up against it. 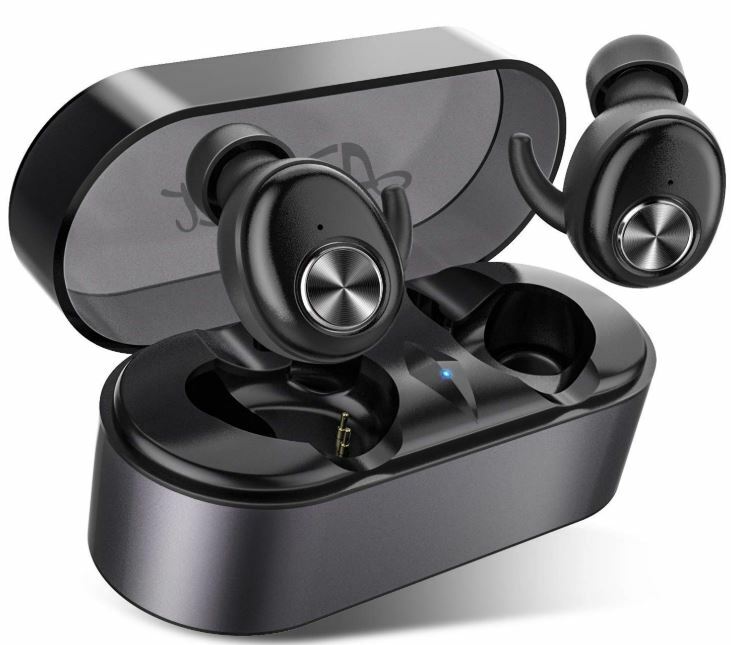 That means once they’re in position, they provide a fair amount of noise isolation, about the same amount as any other pair of earbuds which operate the same way. It’s approximately 6dB of noise isolation, which is one additional detail that contributes to sound clarity during your listening. The comfort of earbuds always comes down to the silicone tips and flange. 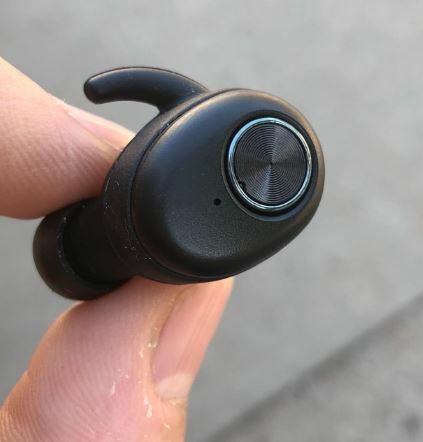 As with most quality sweat proof Bluetooth wireless earbuds in this price range, the AairHut A2 allows you to select between a variety of ear tip sizes. They include small, medium, and large. Additionally, there are two optional flange sizes, which is the piece of the earbud which keeps the device comfortably secure in your ear. Are the AairHut A2 comfortable? The answer is most likely yes, but it ultimately depends on you. Whenever size options are available, your odds greatly increase. Yet finding the right fit is generally simple if you take the time, especially when the manufacturer provides variable size options like the AairHut A2. By design, most people will find the medium sized tips quite comfortable. Nevertheless, it’s a good idea to take fifteen minutes to check the various sizes and see which feels best for you. And if you plan on athletic activity, make sure it doesn’t just feel good, but also provides the right firmness to stay in your ear during activity. Given the soft silicone parts, after you’ve taken a few minutes to look over your options, comfort levels should range between above-average and excellent. The quantity of battery life you can draw from the AairHut A2 Sweatproof Bluetooth True Wireless Earbuds really depends on how you plan on using them. If you’re running stereo audio with both buds, you can expect battery life to be around 15 hours. However, that nearly doubles towards 28 hours if you’re using only one bud. 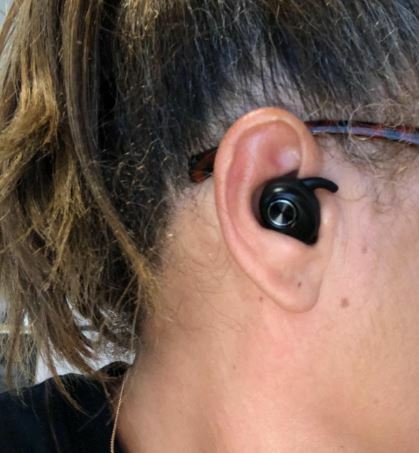 Each individual ear-bud holds about three hours of charge, which is marginally better than the average athletic earbud. Those three hours can be extended out towards 15-hours once you’ve accounted for the charging case, which is where the majority of your battery power is really coming from. Being able to use on earbud also means the second one can be charging, a highly convenient process which allows for four separate charges. There are some worth advantages from moving to the latest Bluetooth 5.0 format. It’s what underpins the AairHut A2’s smooth connectivity and support and strong 3D audio. 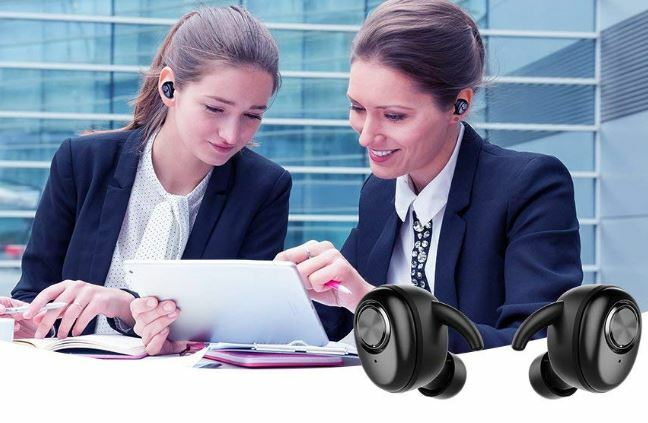 Supported with the latest iteration of Bluetooth, you’ve only got to pair with your devices a single time. From then on your device will remember what you want automatically, allowing you to just pop the AairHut A2 earbuds out of the case and go. The AairHut A2 supports Siri, hands free calling. It can be commanded to play, pause, skip, or rewind through tracks. And it provides phone number announcements so you can determine who’s calling you when they’re not in your address book. While Siri support is excellent, the AairHut A2 does not provide support for Alexa, Cortana, or Google’s assistant. Each earbud has its own microphone, which is a huge help for orchestrating background noise reduction. Although the AairHut A2 doesn’t quite provide a business-quality microphone configuration, this dual-mic setup is quite formidable, and far superior to single-microphone options used by the majority of the A2’s competitors. If you want a truly business-quality microphone that will perform in boisterous environments, like a stock exchange, then you’re going to need to head towards the $150 price point. With respect to its price, the A2’s call value is fairly exceptional. The AairHut A2’s Bluetooth connectivity alerts you with a small flashing light when the battery gets low. This light is generally only visible in darker lighting conditions, or if you’re directly staring at the ear bud with the intent of figuring out its battery status. However, this does mean there’s a handful of environments where you’ve got a flashing very faint light on your head. For example, it might be subpar to have an extra light on your equipment if you’re trying to listen in a dark room near a sleeping family member. Who Should Choose AairHut A2 Sweatproof Bluetooth Wireless Earbuds? The AairHut A2 Sweatproof Bluetooth Earbuds are a fairly strong choice for people who are on-the-go. Externally speaking, they’re subtle, simple, and professional-looking. They use an equally restrained yet effective charging case, which is small enough to stick in a pocket or bag. And they provide the power to keep you charged more than a busy day. With a closer look at the details, most are done quite well. For example, the AairHut A2 is really takes advantage of Bluetooth 5.0 and its simple pairing. And it’s reasonable to say their sound quality compares with earbuds that cost twice as much, even if it’s because there’s a fairly low ceiling on how nice you can make small dynamic drivers sound. All in all, they A2 are a winning combination of portability and fairly strong added features. If you’re able to make use of its mono-bud feature, then the A2 can be more powerful than virtually any comparable earbuds on the market. 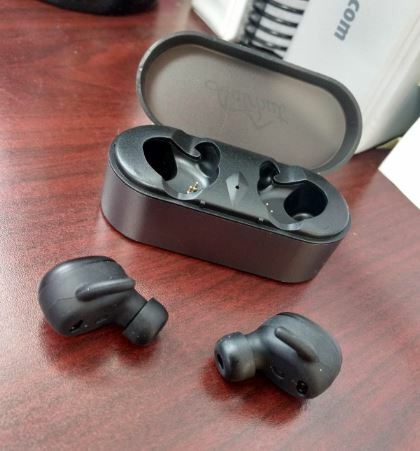 That makes the AairHut A2 worth a close look for anyone on the hunt for active wireless earbuds. 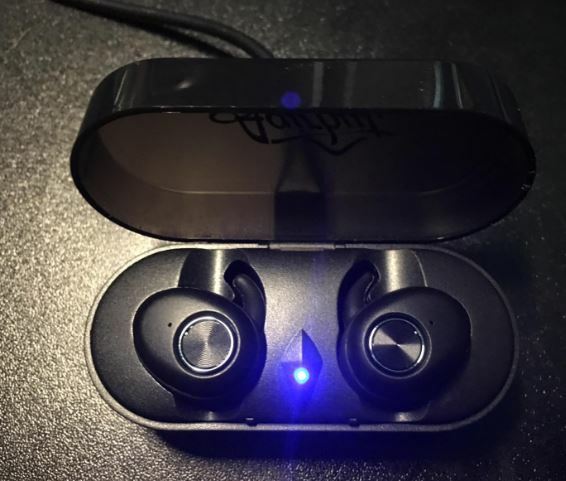 Hello, I just got my airhut2 earbuds and theyre pretty amazing… but, at first they both paired perfectly with my android but today the phone can seee both but only one channel can be found at a time! Help!